The investment staff of the California State Teachers’ Retirement System (CalSTRS) wants to double the number of co-investments in the system’s approximate $18 billion private equity program in the next two to five years, adding 15 new staffers and possibly opening an office in San Francisco to handle the additional investments. The West Sacramento-based pension’s plan to build its private equity program is contained in agenda material for its January 30 investment committee meeting. The investment committee is being asked to approve CalSTRS’s strategic direction in efforts to expand the private equity program, the pension system’s best-producing asset class over the short and long term. CalSTRS’s overall private equity returns for the one-year period ending March 31 totaled 15.5%, the largest return of any asset class. CalSTRS currently has 8.1% of its overall portfolio devoted to private equity, but its long-term target is 13%. CalSTRS investment officials see co-investments as a way to get to that target. Co-investments only account for a small part of the plan’s private equity portfolio, around 5%, said a September report from the Meketa Investment Group, which serves as a CalSTRS investment consultant. The new January 30 plan said that over the last two calendar years, the CalSTRS private equity program has made new commitments of approximately $6 billion to $7 billion a year with co-investments representing approximately 8% to 9% of total new commitments. The plan says private equity’s current team of 23 professionals, 18 who specialize in investments and five operational personnel, are at capacity for the current investment pace and that an additional 15 hires are needed to at least double co-investments. Under co-investments, CalSTRS and other pension plans are offered additional stakes in portfolio companies acquired by private equity firms, often at little or no additional fees. This is usually in addition to the pension plan’s investment as a limited partner in a co-mingled fund with a general partner. Officials of the $214.9 billion CalSTRS see co-investments as a possible entry point to make direct investments in private equity at a later point without external managers. CalSTRS’s approach contrasts with that of its larger Sacramento neighbor, the California Public Employees’ Retirement System (CalPERS), which is proposing to invest $20 billion in additional private equity funds through two direct-style investment vehicles. One vehicle, called Innovation, would take stakes in late-stage companies in the venture capital cycle. The other vehicle, known as Horizon, would take buy-and-hold stakes in established companies. CalPERS currently has around $28 billion invested in private equity. The CalSTRS plan says the competition for high-quality co-investment professionals “makes it advisable to budget for a higher average salary for such professionals” than existing personnel. It does not state, however, what the new staffers should be paid. It says that while public asset classes are largely research-oriented, private asset classes are more relationship-oriented. The plan says San Francisco is an “obvious choice to consider” for the co-investment expansion because there are many general partners located in the Bay Area, including KKR, TPG, and GI. It also said that other major institutional investors, including Singapore’s GIC sovereign wealth fund and the Queensland Investment Corp., have placed private equity professionals in the Bay Area. CalSTRS is the second-largest US fund by assets, surpassed only by the $345.6 billion CalPERS, which is No. 1. I saw this article last week and it caught my attention. Let me begin by stating there's no question in my mind that both CalSTRS and CalPERS need to increase their co-ivestments in private equity to increase their allocation to this asset class which has been a top-performer for both pension funds and to lower overall fees paid to general partners even though they're increasing their allocation to private equity. This is exactly what Canada's large pensions have done over the last five years, namely, increased their direct private equity investments and their allocation to private equity predominantly through more co-investments alongside their GPs (which they still invest with through traditional comingled funds). The big difference, however, is in Canada, the governance is set in a way where there's zero government interference in the day-to-day operations of these large public pensions and that includes in their compensation scheme. Canada's large pensions pay their private equity and other private market senior managers extremely well to do more direct investing (via more co-investments). US public pensions cannot compensate their private equity staff as well but in the case of CalSTRS, they seem to recognize this deficiency and are saying "we need to open up an office in San Francisco and pay our private equity staff market rates to handle this co-investment activity." The California Public Employees’ Retirement System (CalPERS) has ended its consideration of a plan that would have seen a strategic partner play a key role in running its existing $27 billion plus private equity program. BlackRock, Goldman Sachs Asset Management, Neuberger Berman, AlpInvest Partners, Hamilton Lane, and HarbourVest Partners had all submitted plans to CalPERS early this year detailing the role they would play in managing the largest private equity portfolio in the US. John Cole, a CalPERS senior investment officer, told the investment committee at its meeting on November 13 that the plan is now off the table. “A year ago, we thought maybe it would be best to find the large partner in a discretionary role to help us identify good funds and to expand our relationships to include more co-investing and access to secondary transactions,” he said. Cole said the six investment organizations that applied to help CalPERS were all outstanding. “But we have come to the realization after a lot of analysis and discussion that the structure is unlikely to meaningfully strengthen our organization,” he said. Cole did not go into detail and CalPERS never specified whether the chosen firm would have run all or part of the private equity program, which is mostly invested in co-mingled funds with general partners. CalPERS had been in exclusive talks with the world’s largest asset manager, BlackRock, before announcing that it was seeking proposals from a wider set of managers to be a strategic partner in the administration of the private equity program. Cole did not rule out the firms helping CalPERS in an advisory capacity but said no decision would be made until CalPERS appoints a new private equity director in early 2019. The pension plan has been without a private equity director since Real Desrochers left in April 2017 to join a private equity firm. In another major announcement, Cole also disclosed that CalPERS is scaling back a program announced in 2015 by outgoing Chief Investment Officer Ted Eliopoulos to reduce the number of private equity managers from several hundred to 30. The reduction was designed to allow CalPERS to focus its private equity commitments on top-tier private equity managers with the best returns. It was also supposed to simplify administration and allow CalPERS to get better fees by concentrating commitments in a smaller number of managers. Cole said at the Nov. 13 meeting that the pension system had reduced the number of general partner relationships from several hundred to currently around 90 with a target of between 40 and 45.. “We think that makes sense in order not to dilute our impact and, as a result, the returns from the entire private equity portfolio,” he said. CalPERS’s private equity consultant, Meketa Investment Group, questioned the wisdom last year of CalPERS cutting its private equity managers to 30, expressing concerns about missed investment opportunities. In a November 2018 report, Meketa says that investment staff has sought to expand the list of managers with a continued focus on high-quality general partners. “The expansion of the manager set provides opportunity, not only to increase scale, but also pursue strategies beyond the mega and large buyouts in order to add portfolio diversification,” it said. More than 60% of the CalPERS private equity portfolio is in buyout funds. The private equity asset class is CalPERS’s largest-producing asset group in both the short- and long-term. The $361.1 billion pension plan is only 71% funded. The private equity asset class provided CalPERS with a 16.1% net return in the fiscal year ending June 30, 9% over the 10-year period, and 10.5% over the 20-year period, shows CalPERS data. CalPERS is also pursuing an expansion of its private equity program, pending board approval, creating its own $20 billion direct investment program that would invest in later-stage companies in the venture cycle and take buy and hold stakes in established companies. The expansion would be managed by a separate organization, funded by CalPERS, that would have the power to make investments without the approval of the CalPERS board. Cole did not give any indication when the CalPERS Investment Committee, made up of board members, would consider the plan. CalPERS officials had said they hoped to start the program by early next year. I question the wisdom of Meketa, the private equity investment consultant, in advising CalPERS not to reduce the number of its private equity relationships down to 30 at most because I remember Réal Desrochers telling me there were too many relationships at one point and it was negatively impacting the performance of Private Equity. A consultant’s review of the California Public Employees’ Retirement System’s $27.6 billion private equity portfolio has found that the current investment pace is not likely to be sufficient to maintain the pension system’s 8% target to the asset class. The $361.1 billion CalPERS is below the 8% allocation right now; 7.7% of its portfolio is invested in private equity as of August 31. CalPERS is the largest private equity investor in the US. The review by the Meketa Investment Group, scheduled to be presented at the CalPERS Investment Committee meeting on November 13, says CalPERS made $5.3 billion of commitments during the 12-month fiscal year ending June 30, slightly below its $6 billion target. However, the problem goes beyond a $700 million shortfall for CalPERS to reach its target allocation. The pension plan so far has not been able to reach its private equity allocation because it is receiving more distributions as funds end than it can reinvest. Private equity funds normally end after a seven- to 10-year cycle and redistribute profits. The problem for CalPERS is it can’t find enough new private equity investments in any given year, as Meketa notes. Distributions have exceeded contributions for eight years in a row, including the latest fiscal year, the review noted. In the June 30 fiscal year, Meketa found that cash distributions to CalPERS from private equity funds totaled $7.4 billion compared to $4.5 billion in new contributions. While CalPERS made a larger $5.3 billion in new commitments to private equity, not all the money was called by private equity general partners because they did not find suitable investments. Meketa found that CalPERS’s commitments on a calendar year basis have dropped dramatically since 2008, when the pension system allocated more than $14 billion to new private equity funds. Since then, CalPERS has not allocated more than $4 billion in any single calendar year to the asset class, the consultant’s review shows. CalPERS’s own data shows that the pension system has received more than $80 billion in private equity distributions combined for the 11 fiscal years between June 30, 2007, and June 30, 2018, but commitments to new investments in that time period are less than half of that figure. CalPERS’s own investment staff has concluded that the retirement plan would need to make $10 billion in commitments each year for the pension plan to maintain its 8% allocation to private equity, the Meketa review notes. Pension system investment officials have not detailed extensively in public how they plan to get up to that $10 billion number in their top-returning asset class. They have described an environment at investment committee meetings that pits CalPERS against other institutional investors, as they vie to be part of over-subscribed top-tier private equity funds. What’s clear is the importance of the asset class to overall returns. In contrast, the CalPERS overall fund produced an 8.6% return in the latest fiscal year, a 5.6% return for the 10-year period, and a 6.1% return for the 20-year period. CalPERS is only 71% funded. Anyway, it's clear that maintaining an allocation to private equity and increasing it requires a much more concerted effort in increasing co-investments, especially if you want to keep the fees as a percentage of total assets as low as possible. A California Public Employees’ Retirement System (CalPERS) official says the system’s planned private equity direct investment organization could easily commit $10 billion of capital within five years and could also take on several additional investment partners. The comments of John Cole, a CalPERS senior investment official, offer detail about the efforts by the largest US public pension plan to launch an up to $20 billion investment organization that would take investment stakes in late-stage companies in the venture capital cycle as well as buy-and-hold stakes in established companies, a la Warren Buffett. The CalPERS Investment Committee has not yet approved the plan, but most of the 13 members are generally supportive of the concept, though questions clearly remain. The committee is expected to formally vote on the plan within the next several months. Cole said at the committee’s meeting on Dec. 17 that time is of the essence. CalPERS has been negotiating with investment teams to run the new private equity organization but can’t hire anyone until the organization is approved. “The kind of talent we need always has options,” Cole said, noting the competitive nature of hiring top investment teams. He also said the private equity plan has the full support of incoming Chief Investment Officer Ben Meng, who is expected to start next month. Cole said the organization, once approved, could make its first investments within six to 18 months. He then sees a rapid infusion of cash into the two CalPERS-backed organizations: Innovation, which will invest in late-stage companies like the Ubers of the world, and Horizon, which will take buy-and-hold stakes in established companies. CalPERS ultimately expects to commit $20 billion to Innovation and Horizon, but that could take up to a decade. In response to another question from Brown, Cole said initially CalPERS would be the sole investor in Innovation and Horizon, but said additional investors were possible in future years. “What we’ve done is to enter into this with a belief that we must be the sole investor in order to set this up and to make sure that it meets our needs, first and foremost,” he said. 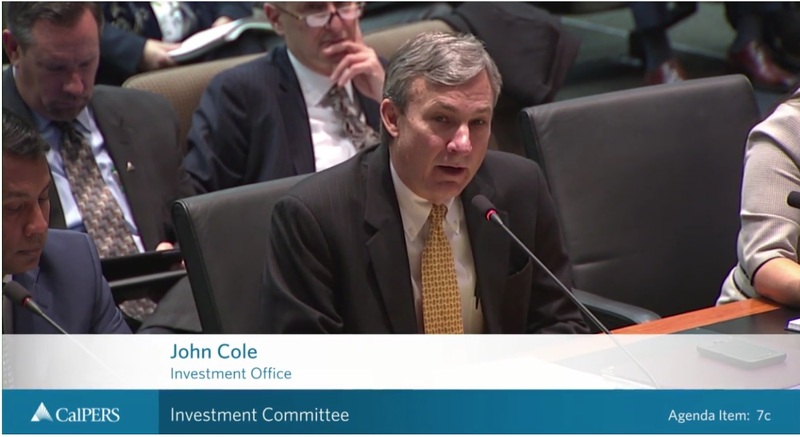 Cole then said CalPERS could be open to one or two additional partners that could add capital and share expenses for the planned private equity organization, dubbed “CalPERS Direct.” He did not lay out a timetable for additional investment partners. The investment officer also defended the “CalPERS Direct” concept, which has been met by some criticism, including that of former committee member and system portfolio manager, J.J. Jelincic. The criticism is that “CalPERS Direct” isn’t really direct at all, like the way the Canadian pension plans operate, because the pension plan is proposing a limited partner (CalPERS) and two yet-to-be-announced general partners that would make the investments for Innovation and Horizon. This contrasts with major Canadian pension plans who have in some cases cut out the middleman and do private equity investments directly. CalPERS officials have never fully explained why they have rejected the Canadian model, except to say that the general partner-limited partner arrangement would allow CalPERS to pay the multimillion-dollar salaries that are necessary to attract top investment staff. Jelincic attended the December 17 committee meeting, arguing that the new private equity investment program would be risky investment-wise. He said that if the investment committee was intent on a new private equity program, it should run the program internally without an external general partner. Jelincic said that would give CalPERS full control managing the program. Jelincic has also made comments previously that the new private equity organization would not save CalPERS any money on fees. The expense of CalPERS’s existing $28 billion private equity program, which would run alongside the new private equity organization, has been a long-term controversy. In the existing program, CalPERS pays management fees of up to 2% to the general partners who manage the funds that CalPERS participates in as a limited partner. The general partners take 20% of the profits from managing the investments, even though they put up little or no money. Acting investment committee member Steve Juarez, representing State Treasurer John Chiang, brought up Jelincic by name, and questioned Cole about the fees that would be paid to the general partners and their investment staff in the new private equity organization. Cole also said the 20% profit sharing received by the general investment partners would also decrease over time as investment organizations become larger and increase their asset base. He didn’t offer specifics. Another area of controversy is the limited disclosure that would be made to the public about investments by the new private equity organizations. The investment organizations would disclose investment results, but much of their activities would operate in secret. Advisory boards formed to monitor the Innovation and Horizon investment teams would not have public meetings and the overall investment organizations would not be subject to public record requests. Also, the investment staff of new organizations would not be required to fill out state disclosure forms on their investment holdings. Brown said she and other unnamed investment committee members remain concerned about the lack of transparency. I agree with John Cole and Matthew Jacobs, CalPERS' board of directors doesn't need to have full transparency on what is going on in these investment vehicles, it needs a level of transparency to feel comfortable and to monitor the progress. Ben Meng, the new chief investment officer of the California Public Employees’ Retirement System (CalPERS), says a planned expansion of its private equity program to a more direct approach will allow the pension system to increase returns in its best-producing asset class, helping CalPERS meet its 7% average yearly return expectations. “In order to achieve 7%, our required rate of return, there is no option but to do more in private equity,” Meng said in a press briefing with reporters Tuesday afternoon at a CalPERS retreat meeting in Rohnert Park, California. CalPERS investment officials plan to keep the plan’s existing $27.8 billion private equity program, which is mostly made up of CalPERS participating as a limited partner alongside other institutional investors in funds run by private equity firms. The program would coexist alongside the planned direct-style private equity expansion initative. CalPERS’s traditional private equity program has been shrinking. It made up just 8.1% of the pension plan’s $345.6 billion portfolio as of Oct. 31, 2018, down from 9.5% four years earlier. As competition heats up between institutional investors for limited spots in what are expected to be top-producing funds, CalPERS is increasingly being shut out. CalPERS investment officials see a way around the shrinkage of the asset class by creating an up to $20 billion investment organization that would shun private equity firms. Instead, CalPERS would create and fund two private equity investment vehicles: Innovation, which would invest in late-stage companies in the venture capital cycle in healthcare, life sciences, and technology. and Horizon, which would take buy-and-hold stakes in established companies. It’s clear why CalPERS wants to expand private equity, given attractive returns for the asset class. CalPERS produced an 8.6% overall return for the fiscal year ended June 30, 2018, but private equity results topped 16%. Over the 10-year period, CalPERS private equity returns have been 10% compared to 5.6% for the overall fund. The new private equity plan is not without controversy because CalPERS would provide funds for Innovation and Horizon, but investments would be controlled by private equity general partners. CalPERS would be the sole limited partner initially in the relationship. The CalPERS private equity plan differs from the Canadian model, in which Canadian pension make some of their private equity investments directly without general partners. Meng said someday CalPERS might be able to adopt a Canadian-style private equity model but said there are obstacles in the near-term because new rules and regulations would be required to create the program. “We can do direct maybe in the future, but today I don’t think we are ready because of a number of limitations,” said Meng. He said those obstacles included not only a revamp of CalPERS’s governing rules, but the difficulty of attracting top-notch investment professionals to CalPERS’s headquarters city of Sacramento, as it is not a global financial center. CalPERS officials have previously disclosed that if CalPERS runs the private equity organization directly, it would have to disclose expected multi-million-dollar compensation for investment team leaders running Innovation and Horizon, creating potential public outrage. Under the current plan for Innovation and Horizon, that wouldn’t be an issue, because the two investment organizations would be shielded from public disclosure laws as they would not be directly part of CalPERS, even though the pension plan would fund them. CalPERS officials had said previously they expected to present the Horizon and Innovation plan to the system’s investment committee by February or March, but Meng said there is no specific timetable to get the plan approved. He did say that CalPERS is moving as fast as possible to get the plan to the investment committee. CalPERS Chief Executive Officer Marcie Frost, who joined the interview with Meng, said the pension system is conducting detailed checks on potential investment team leaders that would act as general partners for Horizon and Innovation. “We are still doing due diligence,” she said. “This is the No. 1 responsibility that we have for the fund is that we have to conduct a very thorough due diligence on anyone this organization would partner with,” she said. Meng said CalPERS is talking to a number of candidates to lead the investment teams, but he would not disclose how many. Pension system officials have previously disclosed that they include David Roux, a co-founder of Silicon Valley-based private equity firm Silver Lake, and Adam Grosser, who oversaw Silver Lake’s Kraftwerk fund. Silver Lake is best known for its investments in technology companies. I'd be surprised if Silver Lake isn't chosen as a GP since it's one of the best technology private equity funds in the world. What is clear is Ben Meng understands very clearly the constraints he's operating under. He previously worked at CalPERS before moving back so he knows the terrain and politics extremely well. He also ordered a full review of CalPERS's investment activities over the next 180 days, one that will include an investment performance attribution analysis to uncover the drivers of CalPERS returns. I'll give him one recommendation, apart from increasing co-investments (a form of direct investments) through these new private equity vehicles, it may make sense for CalPERS to get back into certain highly scalable hedge fund strategies and develop long-term relationships with top alpha managers. In other words, don't just focus all your attention on illiquid alternatives (private markets), focus some of it on liquid ones and the key here is to hire the right team to help you set up operations (experienced people like Daniel MacDonald, the Head of Advisory and Pensions at Middlemark Partners can advise CalPERS). Lastly, naked capitalism is back at it, going after CalPERS any chance it gets, like its recent comment how private equity expert Dr. Ashby Monk repudiates CalPERS CEO Marcie Frost's private equity scheme. I can only take these comments in doses, they're so slanted and sloppy, I leave it up to my readers to review. Below, John Cole speaks at the CalPERS investment committee on November 13, 2008. I also embedded the CalPERS investment committee meeting which took place on December 17, 2018 (fast forward to 2:48 to get to private equity section). Lastly, I embedded a clip on private equity from the CalSTRS's investment committee which took place in mid November. All three clips from this investment committee are available here. I will post today's board meeting once it is publicly available here. (a) The board shall appoint and, notwithstanding Sections 19825, 19826, 19829, and 19832, shall fix the compensation of an executive officer, a general counsel, a chief actuary, a chief investment officer, a chief financial officer, a chief operating officer, a chief health director, and other investment officers and portfolio managers whose positions are designated managerial pursuant to Section 18801.1. I thank J.J. for sharing this with me and find it odd that CalPERS Board doesn't set higher compensation to attract and retain qualified staff in private equity and other activities.